I'm back! Boy what a month it's been! It's been exactly a month since my last post, but I assure you I have not been slacking. My wife and I bought a house and sold a house in 6 days!!! ...no kids yet, but it's always good to plan ahead! 4. Sellers market provided a unique opportunity to offload our current condo (old construction, some issues with the HOA that have been bothering me for a while). After serving as our HOAs treasurer for several years, I finally began to realize that our property had some intrinsic characteristics that would not allow us to lower maintenance fees in the immediate future. We decided to act on a "hunch" we had for a year or more to sell and get into a slightly larger home, and I'm sure glad we did. My wife and I were in a great position with a paid off condo, but I knew our home was not large enough for a family. With prices on the rise, and interest rates also increasing I knew we had to act quickly. I contacted a Realtor who was familiar with the unique characteristics of our property, and was equipped to overcome objections prospective buyers may have... (like the $800/month HOA fees on a 538 sq ft condo)! As it turns out, we accepted an offer on our home after a few back and forth negotiations 2 days after it went on the MLS! We accepted it as it was $20,000 more than the comps and it was an all cash offer... which turned out to be a very essential part of our transition. We ended up putting an offer on another property, contingent upon the sale of our current home. The seller of this property initially wasn't interested in accepting a contingency, but with a good price and a cash buyer for my current property, he signed the sales agreement! So with that, my wife and I were PUMPED! Inspections on both places went well, just had to pay a bit more to fix up our current home. I gave the buyer a $500 credit, and also fixed some plumbing valves to the tune of about $200. We asked the owners of the property we purchased to give us a $375 credit for half the cost of a new dishwasher, toilet, and ceiling fan. I felt that was fair. The next piece of the puzzle was how we would buy the home. Financing? Large vs. Small down payment? We decided to roll the all but $10,000 of the sales proceeds into the new home (about half of purchase price) with the $10,000 bench-marked for future improvements. I took out a mortgage of $184,000, which after allowing for $290 in monthly HOA fees offered us an affordable housing payment; even if my wife eventually needed to stay home to care for our kids. I feel like this is a very important step that many potential young home buyers need to account for. Eventually, one income earner may need to stop working for a while and the remaining income earner must be able to support monthly needs, including contributions to retirement accounts! A rule of thumb for me was I wanted to be able to save 15% of my own gross income for retirement even if my wife had to stop working. I feel this is critical for people in a similar situation to do. So, some takeaways from this home buying and selling experience. 1. Realtors are a big help. 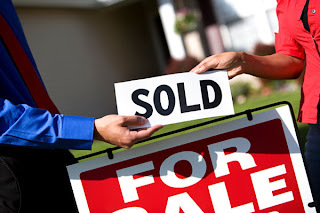 Many bloggers suggest trying to "go it alone" in the home buying process (or even selling! ), but I am very grateful for the expertise my realtors shared. I knew my housing market like the back of my hand, but still found my buyers agent incredibly helpful. I wouldn't do it differently if I had to do it again. Having said that, if you've bought property before, it may be a good idea to do it on your own but it sure is nice to have some help the first time though. 2. Interest rates change daily, and sometimes very rapidly. Get preapproved and act quickly if you have a good set of circumstances. We were able to lock in a 4% interest rate on a 30 year fixed, which I'm grateful for as rates have since escalated to 4.6%. 3. Have an idea of what you plan to do with future "excess" cash, i.e. will you pay down your mortgage principle, invest in retirement accounts, or invest in taxable accounts. For my wife and I, we are not yet maxing out my 401k, so I will increase our savings rate to do this. If we get to the point where our roth IRAs and 401k are maxed out, we'll put extra toward the principle (or 529 plans). 4. Selling and buying real estate results in VERY HIGH TRANSACTION COSTS! All in all, I believe we paid close to $15,000 in fees via realtor commission, closing costs, inspections, etc. Don't buy and sell often...be like buffet and hold onto it as long as you can. This $15,000 has decreased our net worth, and can best be recouped by having some patience and discipline. With that, I must leave you for today. I have to call my realtor and figure out how to protect myself in the event the tenant that is living in the home we're buying damages anything prior to us moving in. There's always something that comes up... Sept. 1st can't come soon enough!!! *This post was featured in the July 21st Yakezie Carnival!